Amazon Prime. Netflix. Hulu. Xbox Live Gold. Xbox Game Pass. Pandora. Texture. Spotify Premium. Groove Music Pass. YouTube Red. Office 365. Loot Crate. PlayStation Plus. Audible. Sling. Patreon subscriptions. Apple Music. NFL Game Pass. MLB TV. NHL Center Ice. If you’re like me, you subscribe to more than a handful of these services. Each one takes a small slice out of your pocket book, every month. Should you ever stop paying for that service, it all vanishes. At what point do we collectively decide we’ve had enough, and go back to paying for something once and only once? In the 1990’s, the holy grail of software companies was to offer Software As a Service. As a company, you would offer a piece of software that a user or business could have access to for a small monthly fee. This is guaranteed monthly income for as long as your software is being used, and all you have to do is maintain that application or environment to keep your users coming back. I remember reading an article back in 1999 or 2000 that this was the end-goal even for operating systems like Windows. The idea was that ultra-fast internet would be ubiquitous and that we would all have thin clients and everything we do would be handled up in the cloud. We would pay Microsoft a monthly fee for access to that cloud-based operating system. Windows 10 has taken steps to get us there, but the unfortunate truth of the state of broadband internet access in this country is that purely cloud-based operating systems are a ways off. But that’s where the idea of something like Office 365 steps in. Microsoft, instead of selling you a copy of Microsoft Office for $200, $400, or even more – charges a friendly $12.95 per month for the premium plan, and suddenly you have access to a whole suite of software and tools, all of which will be perpetually updated for you, no need to buy a new version every few years! It didn’t take long for others to want to find a way to offer their platform “as a service” and dip in to that comfortable monthly revenue stream. As news papers and magazines collapsed around the country, pay-walls started cropping up on news sites, and magazines combined forces with new services like Texture. Music services came and went, but Spotify, Tidal, and Apple Music have made lasting impressions. Netflix is king of the mountain, while services like CrunchyRoll serve special audiences. Even the WWE network offers everything from archives to live Pay Per Views for ten bucks a month. Earlier this week, when Microsoft announced Xbox Game Pass, that’s when I realized that I don’t think I can handle another monthly “service.” Think of it in terms of annual fees. 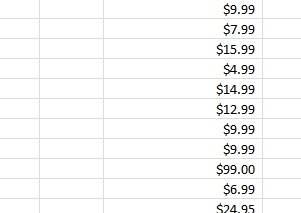 Microsoft offers a discount if you have Xbox Live Gold, instead of $10 per month, it’s a convenient $59.99. But, as far as we know, there’s no such deal for the new Game Pass service. Now, if you’re like me and you pretty much only have an Xbox Live Gold subscription so you can get the “Games with Gold” free games every month, you can drop your Gold subscription and pick up Game Pass, but you’re more than doubling your annual commitment to Xbox services. But if you want the ability to play the new games you have access to in multiplayer? Well, then you’re still required to pay for Xbox Live Gold. If you pay in advance, it’s $60, bringing your annual tithes to Xbox Live to $180. If you can’t afford to pay up front and have to pay monthly for a gold subscription, they’re $10. $240 per year just in Xbox fees. Sure, you can do a cost-benefit analysis of your own, and say “sure, it’s $240 per year, but if I were buying brand new games at $60 each, that’s only 4 games.” Fair play, I won’t argue with that. But how many other services do you have? What all are you paying for, per year? And if you factor it all out, do you really think you’re getting your money’s worth out of every single service you’re paying for every single month? Although it’s great for business ledgers to show constant revenue, it’s clear that too many industries want in on the same business model and are starting to spread consumers too thin. We’re nickel and diming ourselves to death, of our own free will. We’ve cut the cord on $150 cable TV bills, so that we lose bundling discounts and end up paying $80 for our internet, $12 for Netflix, $12 for Hulu, $15 for Spotify, and then add on all of our other preferred services. What’s worse is that none of these convenience services even consider the cost of other bills most people have from month to month. A mortgage or rent, utilities like electric, gas, and water, an ever-present cell phone bill, car payments, insurance costs, groceries, and more. When will people say “enough is enough?” I’m one of the people who cut the cable TV cord in 2008 and hasn’t looked back since. But I may also be an early adopter of the idea that monthly fee’s aren’t for me. When it comes to a car, my personal preference has always been that “it’s better to own, than to lease.” I’m starting to feel the same way about my content and the things I enjoy. A one time cost is sounding better and better all the time, compared to never ending monthly fees.